How many of us are aware of the moment we are living in right now? Or even what surrounds you at this moment in time. Do you remember what the last person said to you? Or are you too busy getting to the next thing you have to do. When we focus on what’s ahead we miss the moment we are in right now. Those moments make up the journey we are on. Life isn’t a race. I have learned to slow down and live in the present! Not easy, I know. It took me this long to figure it out. I wish I would have taken the time to notice my life along the way. Oh, I suppose I did in some areas of my life, but I was always looking ahead. My travels this summer have taken me to some amazing places. Along the trails, I made sure I stopped and enjoyed the beauty that constantly surrounded me. I didn’t just walk by. On the rivers, I would notice the lonely flower along the bank as it’s bright color stared back at me. And the calmness of the water before the rapids took me for a ride on the white caps that seemed to envelope my kayak and bring me back to the calm. 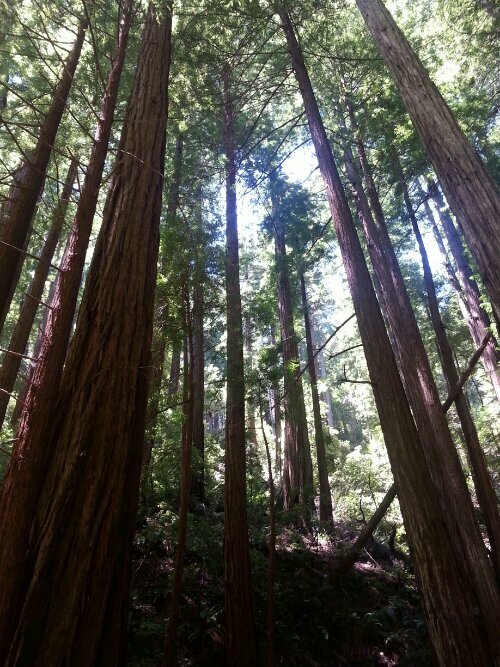 The Redwoods above spoke to me. I layed on the ground and looked up and this is the shot I took. It was breathtaking to me. I met people from different countries along the trail, took their pictures, and laughed with them. I’ll never see them again but what fun we had in that moment we passed each other as we traveld the same path for a minute or two. What we choose to look at in life can affect where we go and how much of life we really enjoy. Take the time to look up, breathe in, and appreciate the moments in your life. Smile a little longer, and laugh along the way. You’ll be amazed at how your perspective on life changes.